Nothing beats celebrating the holidays than being at home with your loved ones. You know Christmas is just around the corner once the tradition of Simbang Gabi starts. More than being a religious tradition, going to daily masses at the break of dawn is a family affair. There's that belief that completing nine days leading to Christmas eve can grant your wish, but let's admit it, we also do it because there's something special about going to church with your loved ones while enjoying the crisp Christmas air. While the rest of the world feasts on roasted chicken, duck, or turkey during Christmas, we have traditional sweets and dishes that makes Noche Buena all the more exciting. There's the ever present puto bumbong and bibingka, along with the staple queso de bola, leche flan, pancit, and Christmas ham. If your family tradition includes a grand clan reunion, you'll also probably have lechon on your table because, let's face it, it's our love for food that makes holidays special. We have Kris Kringles (also known as Secret Santa or Monito-Monita) that often end up in Exchange Gift programs in December. We also get aguinaldos from our Ninongs and Ninangs, and the concept of going house to house and greeting elders with "Mamamasko po, Merry Christmas!" to get gifts and goodies in return isn't entirely foreign to us. To Filipinos, the most important thing about celebrating the holidays is spreading joy through giving and sharing. Christmas parties is that one day of the year that we can actually enjoy work without deadlines and other work concerns hanging over our heads. There's the tradition of "exchange gifts" and of course all the party games and "bandehados" of food we can all enjoy. It's also that time of the year when we get to crack our dance moves for various group performances. We're pretty sure almost everyone of us have those embarrassing (or fun) dance numbers to look back to every year. Who doesn't love Christmas bazaars? From clothes to decors, you'll find massive sales happening left and right, making it harder for us to hold onto our 13th month paychecks. It's also the perfect excuse to buy new outfits to last the entire holiday season (which extends up to January the next year). Pinoys are also famous for being musically talented, which is why house to house caroling is part of our traditions. Our nights aren't complete without hearing "Sa May Bahay" and "Pasko Na Naman" from the neighborhood kids and there is always that joy when we see them walking away with our humble aguinaldos. At home, we have the traditional parol to commemorate the Three Wise Men's discovery of the birth of Jesus. We also bedeck our houses with blinking fairy lights and various decorations to show our neighbors just how excited we are of the Christmas season. 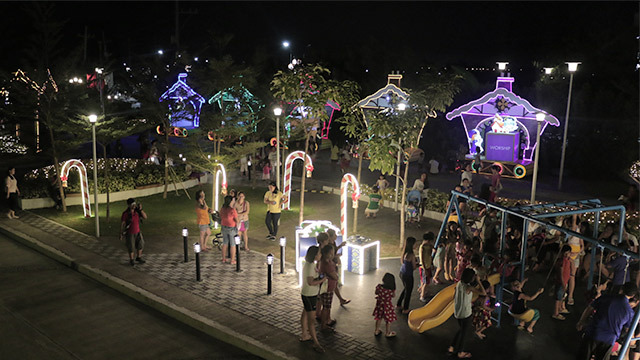 Public places like malls, parks, and even big residential communities like Lancaster New City also organize pyro musical events and Christmas light shows that attract dozens of Pinoy families at night. These colorful festivities remind us that Pinoy Christmas culture will always be special because we're with our loved ones. Want to try a new Christmas tradition that has tatak Pinoy written all over it? Lancaster New City in Cavite lets you experience all these and more from November 26, 2016 to January 8, 2017. They have events and activities for the whole family to enjoy including an Open Air Cinema where you can watch movies that are undeniably Pinoy like Achy Breaky Heart and Everything About Her for free, all while enjoying the wonderful Christmas atmosphere only a truly Pinoy community could offer. Check out the Facebook event page here for more details and click here to catch a glimpse of Lancaster New City's colorful activities this holiday season. This article was created by Summit Storylabs in partnership with Pro-friends.